The University of the Fraser Valley men’s volleyball team lost a five-set heartbreaker on Friday evening, falling to the College of the Rockies Avalanche in Cranbrook. After splitting the first two sets, the third proved pivotal, as the Avalanche outlasted the Cascades in a 28-26 marathon. 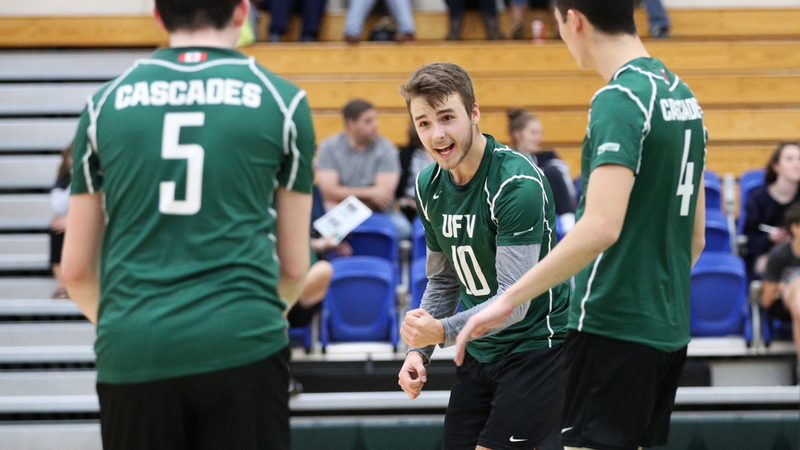 The UFV squad bounced back to take the fourth 25-20, but ran out of gas in the fifth and fell 15-9. Matt Whittall had a big night for the Cascades, hammering down 16 kills on 31 swings. Ben Friesen notchd nine kills, Landon Uy had seven, and Josh Fefchak had six, while setter Adam Frederickson handed out 30 assists. Friesen’s eight digs were a team-high. The Avalanche (1-4) earned their initial victory of the campaign, while the Cascades (0-3) are still in search of a win. The Cascades volleyball teams take another crack at the Avalanche on Saturday afternoon, with the women’s game set for 1 p.m. and the men following at 3 p.m. Webcast available at pacwestbc.tv.